*EU INSPIRE, or Infrastructure for Spatial Information in Europe, is a EU directive that aims to create a spatial data infrastructure of EU data. The infrastructure will enable policy making across boundaries, especially environmental. The directive also aims to improve public access to spatial information. Data specifications must be followed by EU member countries when submitting data, including providing data in INSPIRE compliant GML format. For more information please visit the INSPIRE website. The following demonstrations illustrate how to read and write INSPIRE GML data. However, these examples are pertinent to handling any application schema based GML, and the web service examples are to any OGC web service. These INSPIRE examples are built on recent improvements in FME’s application schema based GML reading and writing capabilities, and require FME 2014 or later. 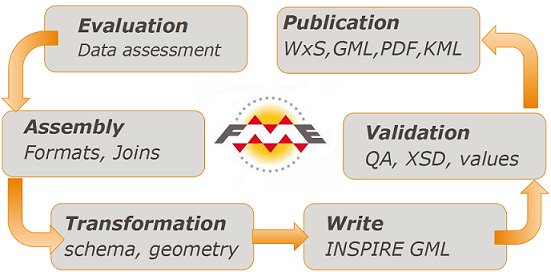 FME endeavors to support the latest release of application schemas for INSPIRE. In FME 2014 SP2 these were updated to version 3 for Annex I, II and III released by JRC in March 2014 - see: http://inspire.ec.europa.eu/schemas/ . FME supports both reading and writing INSPIRE GML data. INSPIRE GML reading is as simple as pointing at the source dataset and choosing among a range of options for selecting and flattening. It is also easy to write INSPIRE GML using the INSPIRE GML Writer with built-in application schemas (XSDs). Validation helps you determine whether or not your data is compliant with the INSPIRE schemas. FME uses certain conventions to represent the nested structure of GML within our feature model. For OGC services, you can either consume INSPIRE GML via WFS or publish it to an FME Server hosted WFS data streaming service. This example discusses the general process to transform data into INSPIRE compliant GML. INSPIRE workspaces usually contain similar steps. However, these steps can be modified, and the order altered, to suit the INSPIRE theme. This example represents a very basic workflow for producing the minimum requirements necessary to satisfy a given INSPIRE schema for one record. It is also a good starting point if you don't have any sample data and need to generate data directly from the destination GML schemas. If you are new to INSPIRE, the Cadastral Parcels writing demo is a good place to start. It covers the typical workflow to write INSPIRE compliant GML, which can be applied to other INSPIRE themes, such as schema mapping and ID generation. Geometry transformation from simple single-part geometry to complex multi-part geometry is also discussed. This example demonstrates how simple it is to move data between two different open standards using FME. The demo highlights the use of the Schema Mapper transformer, as well as geometry transformation in which AIXM data is restructured to match INSPIRE geometry requirements. In this demo, three different regional sources of data - Natura2000, Helcom and Swedish EPA - are mapped to meet the INSPIRE Protected Sites model requirements. This transformation is based on the actual workflow used by the Swedish Environment Agency to map from multiple national and regional sources to the European INSPIRE standard. The INSPIRE Geographic Names demo generates INSPIRE compliant Geographic Names GML 3.2.1 data from UN gazetteer shape files. This example includes combining multiple feature types, as well as illustrates two different methods of schema mapping. Writing INSPIRE compliant Annex III Natural Risk Zones GML is demonstrated in this example. The data is prepared for the INSPIRE schema through reprojection, ID generation, addition of required fields, schema mapping, and geometry transformation. INSPIRE GML is written using the INSPIRE GML Writer, with built-in INSPIRE schemas. During writing, the GML is validated for XML syntax and schema. CityGML is transformed into INSPIRE 3D Buildings GML. The INSPIRE GML is written using the INSPIRE writer and built-in INSPIRE BuildingsCore3D theme (XSD). FME has a workspace based approach to supporting OGC Web Services on FME Server via the data streaming service. This example demonstrates how to create a FME service broker workspace that handles the web message traffic – accepting requests and generating responses according to the chosen service standard. Other web services, such as WCS, WPS, WMTS or SOS, could also be supported by this FME workspace service broker approach. An INSPIRE OGC web mapping service (WMS) is created using two FME workspaces and FME Server's data streaming service. A service broker workspace handles the web message traffic, accepting GetCapability requests and generating responses. Another workspace accepts GetMap requests and provides the appropriate imagery data to the client. FME provides a simple way to download and translate data from ATOM based web services that provide links to data packages. A growing number of organizations are meeting INSPIRE data download requirements by providing ATOM feeds which can be easily read in FME. This example features an FME Workspace which can read free INSPIRE Road network data from the Danish Geo Data Agency (Geodatastyrelsen) ATOM web service and translate this into any desired format. An INSPIRE ATOM feed is created using twp workspaces and FME server. Users can subscribe to the feed and download data. For more information, see the resources from 'Complex GML' and 'FME Server OGC Web Services' that were offered as INSPIRE courses at the last FME UC.